Researchers have quantified the contributions of industrialized and developing nations’ historical emissions to global surface temperature rise. Recent findings that nearly two-thirds of total industrial CO2 and CH4 emissions can be traced to 90 major industrial carbon producers have drawn attention to their potential climate responsibilities. Here, we use a simple climate model to quantify the contribution of historical (1880–2010) and recent (1980–2010) emissions traced to these producers to the historical rise in global atmospheric CO2, surface temperature, and sea level. Emissions traced to these 90 carbon producers contributed ∼57% of the observed rise in atmospheric CO2, ∼42–50% of the rise in global mean surface temperature (GMST), and ∼26–32% of global sea level (GSL) rise over the historical period and ∼43% (atmospheric CO2), ∼29–35% (GMST), and ∼11–14% (GSL) since 1980 (based on best-estimate parameters and accounting for uncertainty arising from the lack of data on aerosol forcings traced to producers). Emissions traced to seven investor-owned and seven majority state-owned carbon producers were consistently among the top 20 largest individual company contributors to each global impact across both time periods. This study lays the groundwork for tracing emissions sourced from industrial carbon producers to specific climate impacts and furthers scientific and policy consideration of their historical responsibilities for climate change. A Springboard Commentary to this paper is available at doi: 10.1007/s10584-017-2042-9. The online version of this article (doi: 10.1007/s10584-017-1978-0) contains supplementary material, which is available to authorized users. The question of responsibility for climate change is central to public and policy discourse over actions to curb greenhouse gas emissions and limit adverse impacts. The United Nations Framework Convention on Climate Change (UNFCCC) established the principle of “common but differentiated responsibilities” among nations, signaling the recognition that nations that had produced the larger share of historical emissions bore a greater responsibility for avoiding “dangerous anthropogenic interference with the climate” (UNFCCC 1992; UNFCCC 1998). Reflecting this principle, the Paris Agreement establishes common commitments, for example to global net-zero greenhouse gas emissions in the second half of this century, while allowing flexibility in mitigation efforts to accommodate different national capacities and circumstances (United Nations 2015). Considerable research has been devoted to assessing how national contributions to greenhouse gas emissions and climate change might be quantified according to differing allocation schemes of responsibility and combinations of anthropogenic climate forcers (UNFCCC 1997; Prather et al. 2009; Höhne et al. 2011; Wei et al. 2012; den Elzen et al. 2013; Matthews et al. 2014; Ward and Mahowald 2014). Key factors affecting the relative contribution of nations to emissions and global mean surface temperature (GMST) increase include the emissions dates, and whether land-use change and forestry, non-CO2 gases, and aerosols are included or excluded (Prather et al. 2009; Höhne et al. 2011; den Elzen et al. 2013; Matthews et al. 2014). Outside of the domain of the UNFCCC, broader societal discussions have begun to consider the climate responsibilities of non-state actors. These include individual high emitters regardless of nationality (Chakravarty et al. 2009) and high-emitting industries regardless of where they are incorporated (Allen and Lord 2004). They also include the major multinational fossil energy companies at the base of the carbon supply chain, who to date have no responsibility from marketed products under existing policy regimes, but whose prospective responsibilities are receiving growing attention in scholarly, policy, institutional investment, legal, and public spheres (Leone 2012; Lubber 2012; Frumhoff et al. 2015; van Renssen 2016). Attention to the responsibilities of fossil fuel producers is supported by recent research by Heede (2014), who found that nearly two-thirds of all industrial carbon dioxide (CO2) and methane (CH4) emissions can be traced to the products of a small number of major industrial carbon producers; 83 producers of coal, oil, natural gas, and 7 cement manufacturers. While recent investigations have addressed the question of how national responsibilities might be shared between producers and consumers of carbon-intensive products (Davis and Caldeira 2010; Peters et al. 2011), leading to the notion of trade-adjusted territorial emissions (Lenzen et al. 2007; Davis et al. 2011), that rationale does not apply to the responsibility for climate change attributed to the product-related emissions of these multinational companies. Here, we extend Heede’s (2014) research to analyze the contribution of emissions traced to these major carbon producers to the rise in atmospheric concentrations of CO2 and CH4, GMST, and global sea level (GSL). A benefit of the simple climate model approach is the ability to explore the emissions traced to major carbon producers in a way that is consistent with major climate- and impact-relevant Earth processes. Since annual carbon emissions partition between the main carbon reservoirs—ocean, terrestrial, and atmosphere—a climate model can assess the fraction of CO2 remaining in the atmosphere while keeping track of the CH4 lifetime in the atmosphere and the resulting change in GMST. Study of Earth processes over millennia demonstrates that both the land ice volume and ocean volume respond to global mean surface temperature (IPCC 2013). Once we have changes in GMST, we use the model to calculate changes in GSL (Kopp et al. 2016). Two time periods were investigated for removing annual emissions traced to major carbon producers. The first, 1880–2010, represents the historical period with sufficient data available. The second, 1980–2010, follows the publication of the U.S. National Research Council report on carbon dioxide and climate and represents the period of growing awareness in the scientific, fossil energy industry, and policy communities of climate change risks associated with anthropogenic carbon emissions (NRC 1979; Frumhoff et al. 2015; Banerjee 2015). Heede (2014) traces the annual CO2 and CH4 emissions (subtracting lubricants, petrochemicals, road oil, and other non-energy, non-combustion uses) between 1854 and 2010 to the 83 industrial producers of oil, natural gas, coal, and 7 cement manufacturers with annual production exceeding 8 MtC/year in 2006. Of these 90 major carbon producers, 50 are investor-owned, 31 majority state-owned, and nine are current or former centrally planned state industries. The activities of any carbon producer acquired over the course of the historical period are added to those of the acquiring corporation. Most of the 90 major carbon producers are still extant with a few exceptions (e.g., government-run industries in the former Soviet Union). Heede (2014) assumes that carbon was released to the atmosphere the same year of reported activity (i.e., fossil fuel extracted and marketed for combustion and manufactured clinker, a component of cement) (Gibbs et al. 2000; Energy Information Administration 2004). His conclusion that 63% of total industrial gigatonne CO2-equivalent (GtCO2e) carbon emissions can be traced to combustion of their products and direct company operational emissions used a hundred year global warming potential (GWP) of 21 for CH4 emissions (Eggleston et al. 2006). While cumulative carbon emissions is a reasonable proxy for total impact of CO2 emissions on GMST (Allen et al. 2009; Matthews et al. 2009; IPCC 2013), the correspondence is not exact on shorter timescales (Ricke and Caldeira 2014) and does not apply for CH4 (under any value of GWP). Hence, we extend the calculations in Heede (2014) using a simple climate model. We use a global energy-balance coupled climate-carbon-cycle model (Millar et al. 2016) to assess the change in atmospheric CO2 and CH4 concentrations, radiative forcing, GMST, and GSL resulting from emissions traced to these 90 major carbon producers. CO2 concentrations would be directly relevant to impacts such as ocean acidification, while GMST correlates closely with many terrestrial and ocean impacts. We use the GMST to calculate GSL after Kopp et al. (2016). Climate models that rely on the underpinnings of reduced-complexity climate models and fully coupled earth-system models afford a number of advantages. Calibrated with historical observations and fully coupled global climate models, they can provide robust output to characterize global atmospheric CO2, CH4, radiative forcing, GMST (Allen et al. 2009; Meinshausen et al. 2011; Myhre et al. 2013a), and GSL. This approach allows for natural and anthropogenic forcings to be included or excluded to test the relative contributions from anthropogenic emissions at policy-relevant levels of uncertainty. The model used here is based on the impulse response function approach presented in the IPCC fifth assessment report (AR5) and earlier publications (Joos et al. 2013; Myhre et al. 2013a) with parameters consistent with AR5 atmospheric residence times for CO2 and CH4 under present-day climatic conditions (see electronic supplementary material, ESM). The primary extension of the AR5 impulse-response model is the inclusion of a term scaling the time constants of the CO2 impulse-response by a parameter that scales linearly with GMST anomaly and cumulative carbon uptake by the land and ocean (Millar et al. 2016). The model was forced with natural and anthropogenic historical forcings, as detailed in ESM. In order to calculate contribution to GMST, the model also incorporates the Heede (2014) CH4 data for emissions traced back to carbon producers (ESM). Excluding the six producers that only manufacture cement, the average CH4 contribution to total (CH4 + CO2) emissions traced to each carbon producer is ∼8% (n = 84). The changes in GMST were then used to calculate the rate of GSL rise using the comprehensive semi-empirical modeling of Kopp et al. (2016). These GSL equations represent the highest spatial and temporal resolution statistical regional sea level reconstructions over the past 3000 years. Kopp et al. (2016) effectively extract the three components operating on varying timescales (1) GSL primarily from ocean thermal expansion and land ice volume changes, (2) regional shifts from slowly changing glacial isostatic adjustment, tectonics, and sediment shifts, and (3) temporally nonlinear changes such as ocean/atm dynamics. Sensitivity tests examined three sources of uncertainty: (1) climate sensitivity, (2) lack of available data on aerosol emissions from fossil fuel combustion that could be directly traced back to individual carbon producers, and (3) removal order of carbon producers. Sensitivity tests evaluated the nonlinear feedback between thermal and carbon parameters using the low and high range of equilibrium climate sensitivity and transient climate response (ESM Tables 1 and 2). For example, equilibrium climate sensitivity (GMST at equilibrium with a doubling of atmospheric CO2 concentration) is set to the low (1.5 °C) and high (4.5 °C) values of the AR5 high confidence range (IPCC 2013). The full range of possible values for climate sensitivity and other parameters was evaluated and presented in ESM. Here, we present highlight results from best estimate parameter simulations that reflect the historical observations. In a non-linear model, the order of removal of contributions to total emissions has a potential influence on percent contributions. The range of this influence was assessed; error bars for model results represent the influence of removing each carbon producer first or last for the described set of carbon, and thermal parameters and forcing. Fossil fuel combustion releases aerosols (Shindell and Faluvegi 2010). Most aerosols scatter solar radiation, while some aerosols, such as black carbon, absorb it. The net result is that aerosols partially offset the historical greenhouse gas forcing of GMST increase (Myhre et al. 2013b). Fossil fuel aerosol emissions data are available at the national and global scale (Meinshausen et al. 2011); however, we are not aware of data tracing aerosols directly to specific carbon producers. To examine this source of uncertainty, we investigated four categories of climate simulations: (1) full historical forcing (i.e. all natural and anthropogenic forcing), (2) full historical forcing minus the CO2 and CH4 contributions of major carbon producers, (3) full historical forcing minus all historical fossil fuel aerosols, and (4) full historical forcing minus all historical fossil fuel aerosols minus the CO2 and CH4 contributions of major carbon producers. The results of these simulations with the full range of sensitivity tests are in the ESM. Atmospheric CO2 rose by ∼99 ppm from 1880 (289.8 ppm) to 2010 (388.4 ppm) (IPCC 2013). The model simulations with the best estimate parameters and full historical forcing yield an increase of ∼103 ppm over the same historical period (Fig. 1). Low thermal and carbon parameters with full historical forcing give the lowest ppm rise, and the high thermal and carbon parameters with full historical forcing minus all historical fossil fuel aerosols give the highest ppm rise (ESM). Removing the annual emissions traced to 90 major carbon producers from the best estimate full historical forcing case shows that the combustion of their products from the historical period led to a 58.8 (±3) ppm increase in atmospheric CO2 or 57.0 (±2.9)% of the total increased atmospheric CO2 over this period (ESM). This is predominantly (around three-quarters) due to major carbon producer-traced emissions of recent origin. Combustion of their products between 1980 and 2010 led to a 43.8 (±1.3) ppm increase, 42.5 (±1.3)% of total atmospheric CO2 increase between 1880 and 2010. For each forcing case, the contribution of major carbon producer-traced emissions to atmospheric CO2 is nearly evenly divided between the investor-owned companies, majority state-owned companies, and current or former centrally planned state industries (ESM). Along with atmospheric CO2, atmospheric CH4 changes were determined and incorporated into model calculations for radiative forcing, GMST, and GSL (Fig. 1 and ESM). To explore the potential climate responsibilities of non-state actors, it is of particular interest to understand the contribution of emissions traced to major carbon producers that are fully or partially investor-owned. Consider, for example, the contributions of emissions traced to the top 20 investor and majority state-owned companies to the increase in atmospheric CO2 (Fig. 2). Emissions traced to the top 20 investor and majority state-owned companies from 1880 to 2010 contributed ∼27.2 (±1.4)% of increase in atmospheric CO2 over the historical period, using best estimate parameters and full historical forcing (Fig. 2a). Combustion of products from the top 20 companies from 1980 to 2010 contributed 19.6 (±0.6)% of the historical rise in atmospheric CO2 (Fig. 2b). The IPCC AR5 reports a GMST increase from 1880 to 2012 of 0.85 (±0.2) °C (IPCC 2013). The model simulation for best estimate parameters with full historical forcing yields a GMST increase of ∼0.8 °C from 1880 to 2010 (ESM). The historical radiative forcing and GMST trend (ESM) demonstrate the competing influence of carbon emissions and intermittent volcanic eruptions (Robock 2000) or varying levels of historical fossil fuel aerosols (Shindell and Faluvegi 2010). Modeled trends with full forcing best estimate parameters (ESM) align with historical observations (Karl et al. 2015). As expected, removing the contribution of all historical fossil fuel aerosols for best estimate parameters yields a greater GMST modeled increase (∼0.97 °C) over this period. Removing the annual emissions traced to 90 major carbon producers from the best estimate full historical forcing case shows that the combustion of their products from 1880 to 2010 led to a 0.4 (±0.01) °C increase in GMST, 50 (±1.1)% of the total increased temperature over this period (ESM). About two-thirds of this is due to major carbon-producer traced emissions of recent origin. Combustion of their products between 1980 and 2010 led to a 0.28 (±0.01) °C increase, 35.1 (±0.7)% of total GMST increase between 1880 and 2010. Removing all fossil fuel aerosols decreases the proportional contribution of fossil fuel emissions traced to major carbon producers to 41.6 (±0.9)% of GMST increase over the total historical period, 27.9 (±0.6)% due to carbon producer-traced emissions between 1980 and 2010 alone. Emissions traced to the top 20 investor and majority state-owned companies from 1880 to 2010 contributed ∼24.4 (±0.5)% of increase in GMST over the historical period, using best estimate parameters and full historical forcing (Fig. 2c). From 1880 to 2010, emissions traced to the two largest investor-owned (Chevron and ExxonMobil) plus the two largest state-owned (Saudi Aramco and Gazprom) contributed nearly 10% to the historical rise in GMST. Combustion of products from the top 20 companies from 1980 to 2010 contributed 16.6 (±0.3)% of the historical rise in GMST (Fig. 2d). Kopp et al. (2016) report a twentieth century GSL of 12–15 cm. The U.S. Environmental Protection Agency report data for global average sea level change between 1880 and 2010 of 21.9–23.7 cm (US EPA). The model simulation for best estimate parameters with full historical forcing yields a GSL over 1880 to 2010 of ∼18 cm (ESM). Removing the annual emissions traced to 90 major carbon producers from the best estimate full historical forcing case shows that the combustion of their products from 1880 to 2010 led to a 5.7 (±0.1) cm increase in GSL, 32.1 (±0.4)% of the total anthropogenic contribution to increased GSL over this period (ESM). Less than half (∼42%) of this is due to major carbon producer-traced emissions of recent origin. Combustion of their products between 1980 and 2010 led to a 2.38 (±0.03) cm increase, 13.5 (±0.2)% of total GSL increase between 1880 and 2010. Removing all fossil fuel aerosols decreases the proportional contribution of fossil fuel emissions traced to major carbon producers to 26.0 (±0.4)% of GSL increase over the total historical period, 10.9 (±0.2)% due to carbon producer-traced emissions between 1980 and 2010 alone. The contributions of 1880–2010 emissions traced to the top 20 investor and majority state-owned companies to the increase in GSL (Fig. 2 and ESM) contributed ∼13–16% of increase in GSL over the historical period. The lower bound used the best estimate parameters and full historical forcing minus all historical fossil fuel aerosols. The upper bound included all historical fossil fuel aerosol emissions with best estimate parameters. Combustion of products from the top 20 companies from 1980 to 2010 contributed ∼5–6% of the 1880–2010 historical rise in GSL. Notably, emissions traced to 14 carbon producers were consistently among the top 20 largest individual company contributors to each global impact across both time periods (Fig. 2). These include seven investor-owned companies (Chevron, ExxonMobil, BP, Royal Dutch Shell, ConocoPhillips, Peabody Energy, and Total) and seven majority state-owned companies (Saudi Aramco, Gazprom, National Iranian Oil Company, Pemex, Petroleos de Venezuela, Coal India, and Kuwait Petroleum). The rank order of their contributions varies slightly across impacts and time periods as a function of the relative timing of emissions (Heede 2014 in the ESM model). Policymakers, investors, and the public may assign responsibility in various ways for greenhouse gas emissions and subsequent changes in climate and associated impacts. Assigning responsibility for climate change is a societal judgment, one that can be informed by but not determined through scientific analysis. The UNFCCC process, focused on the allocation of climate responsibilities among emitting nations, is a well-established approach to addressing this challenging problem. But, society can attribute climate responsibilities in other ways as well, including to individuals and major emitting industries. Shareholder resolutions and calls for institutional divestment from the primary producers of coal, oil, and natural gas are now contributing to growing public, investor, and scholarly discourse on the particular climate responsibilities of major investor-owned producers of fossil fuels (Lubber 2012; Oreskes 2013; Rockefeller Brothers Fund 2014). This is a reflection, in part, of growing attention to the actions that companies took and could have taken in light of the scientific evidence of climate change (Frumhoff et al. 2015). The tools of attribution science are being applied to characterize specific damages resulting from anthropogenic climate change (Mitchell et al. 2016). 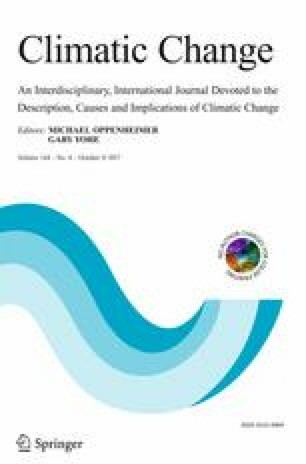 Policymakers in several jurisdictions are now considering whether fossil fuel producers might bear some responsibility for such climate damages potentially traceable to emissions from their products (van Renssen 2016). The present analysis provides a first step to inform such considerations by characterizing several global consequences linked to these emissions. One source of uncertainty in characterizing the contribution of emissions to global climate change is the equilibrium climate sensitivity (ECS) and transient climate response (TCR) to an increase in atmospheric CO2 (IPCC 2013). Parameters were tested through their published range of values. The best-estimate parameters with full historical forcing yield results that most closely aligned with historical observations over recent decades. A secondary source of uncertainty is the short-term effects of fossil fuel aerosols. Typically, nations set the policies regarding aerosol emissions from fossil fuel combustion; hence the aerosols linked to a given product could vary under different regulations governing combustion. If policymakers decide to factor in aerosols traced back to carbon producers when considering their climate responsibilities, steps could then be taken to require reporting of production, processing, and combustion region to better estimate resulting aerosol emissions. Policy in this area should be cognizant, however, of the danger of providing corporations with an incentive to emit aerosols to offset the climate responsibilities implied by their products or “private geoengineering.” Over the long term, the legacy of long-lived heat-trapping emissions outlive the temporary offset from the associated short-lived aerosols from fossil fuel combustion, biomass burning, and other anthropogenic sources (Shindell and Faluvegi 2010; Solomon et al. 2010). With respect to the question of climate responsibility, a third source of uncertainty is the policy relevance of different time periods of historical carbon emissions. Researchers exploring the allocation of responsibilities among nations for greenhouse gas emissions typically consider cumulative emissions over the historical period since 1880, when GMST data are sufficiently abundant and biases in the early records are understood and can be corrected (Matthews et al. 2014; Karl et al. 2015). The attribution of climate responsibility among non-state actors such as investor-owned fossil fuel companies might also take account of the timing by which companies should have reasonably been expected to respond to evidence of the climate risks of their products by, for example, investing in low-carbon energy technologies, supporting climate policies and legislation, or communicating these risks with consumers and shareholders (Frumhoff et al. 2015). Strikingly, more than half of all emissions traced to carbon producers over the 1880–2010 period were produced since 1986, the period in which the climate risks of fossil fuel combustion were well established. Consistent with this, our results show that bounding consideration of cumulative emissions to recent decades (1980–2010) only modestly reduces the global climate impact of major carbon producer-traced emissions with regard to global mean surface temperature. Global sea level rise response to climate forcing operates on slower times scales, so emissions from 1980 to 2010 have less of a relative contribution for GSL compared with GMST. Further research might inform assessments of responsibility for the costs of adaptation for future climate change by considering the legacy consequences of historical emissions on global climate. The warming effect of CO2 emissions is largely realized within a decade after release but persists for centuries to millennia. Other impact-relevant effects, such as sea level rise, will not be fully manifested for a century or longer after emissions (Joos et al. 2013; Ricke and Caldeira 2014; Strauss et al. 2015). In short, calculating only the historical contribution underestimates the total contribution (i.e. historical plus the legacy going forward plus any additional warming associated with the near-immediate removal of the partial offset by aerosols). As a first approximation, one can estimate the impact of historical emissions traced to major carbon producers on near-term future sea-level rise by assuming that no major volcanic eruptions occur and recent historical emissions drive constant rates of sea-level rise for several decades (Joos et al. 2013). Projecting the best estimate full forcing reference case for the average annual rate of sea level rise over 2000–2010 of ∼0.43 cm/year would mean another ∼17 cm above 2010 level by 2040. Without the 90 carbon producers, sea level would rise ∼5.7 cm above 2010 level by 2040. Our study demonstrates that the proportional increase in atmospheric carbon dioxide, GMST, and GSL—key indicators of human impact on the global environment—from emissions traced to major carbon producers is quantifiable and substantial. The analyses presented here could be extended to examine the contribution of emissions traced to major carbon producers to other impacts, such as historical increases in ocean acidification (Ekstrom et al. 2015) or the mortality impacts from extreme heat and other extreme events (Otto et al. 2012; Mote et al. 2015; Mera et al. 2015; Mitchell et al. 2016). Size of contribution, such as calculated in this study, is one factor to consider in assessing responsibility for climate change consequences associated with atmospheric CO2 and CH4, radiative forcing, GMST, and GSL. Other factors include consideration of differences among carbon producers in how they responded to the scientific evidence of the climate risks of their products (Frumhoff et al. 2015). These factors coupled with ethical, legal, and historical considerations may further inform discussions about carbon producer responsibilities to contribute to limiting climate change through investment in mitigation, support for adaptation, and compensation for climate damages. Richard Millar contributed to the nonlinear equation development. We thank Steven J. Davis, Aaron Huertas, Michael MacCracken, H. Damon Matthews, David E. Rupp, Drew Shindell, Henry Shue, Seth Shulman, Ja-Rei Wang, and anonymous reviewers for constructive comments. Support for this study was provided by the Energy Foundation, Fresh Sound Foundation, Grantham Foundation for the Protection of the Environment, Mertz Gilmore Foundation, V. Kann Rasmussen Foundation, Rockefeller Brothers Fund, and Wallace Global Fund. B.E. wrote the paper, co-designed the research, conducted model simulations, and generated figures and tables. J.B. changed the model to incorporate the nonlinear response equation and the semi-empirical global sea-level rise equations. M.W.D. extended the model to incorporate the annual emissions traced to major industrial carbon producers and updated model functionality. R.H. provided the CO2 and CH4 data for emissions traced to major carbon producers and improved the manuscript. RJ.M. modified the carbon producers data format for initial incorporation into the original model. M.R.A. developed the original model and co-designed the research and current model. P.C.F. co-designed the study and co-wrote paper. The authors declare that they have no specific conflict of interest.